I hope you are all fine. Happy new year 2019 Advance. I'm giving you New Year Offer the cheapest guest post on high HQ DA40 to 90 organic backlinks. The best way to rank a website in a high quality from a high authority website. Soi can rank your website by providing such a link. 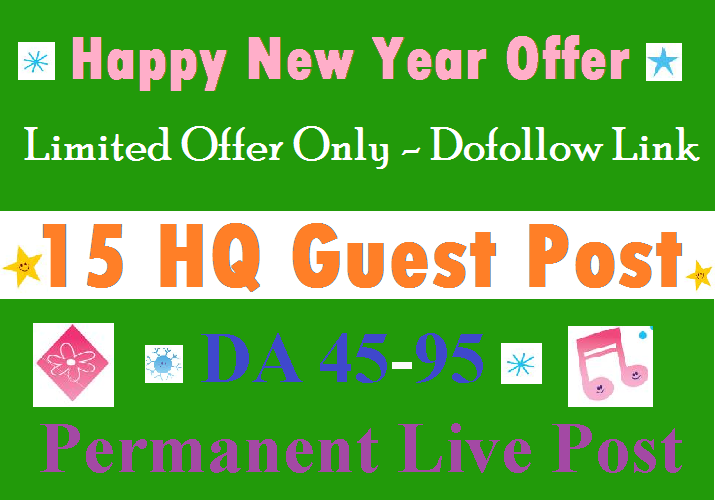 I Can Do 15 HQ Guest Post on DA40 to 95 Cheap Service (Limited Offer) only for $70. It will rank your keyword in search engines and attract more traffic to your website. A high authority guest post to ranking your website on google. So get a touch hurry!! Limited offer only. Notice: I can write unique HQ article, No spin, No rewrite. If you have not written the article to please check my extra service. If you have any question to feel free ask me any time 24 hours!